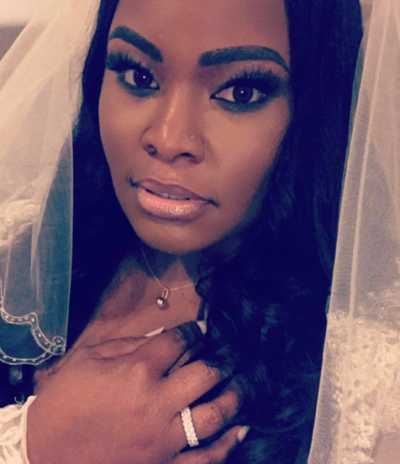 When Tasha Cobbs got married over the weekend, she received an outpouring of support from the gospel music community. According to V103 reports, music producer Kenneth Leonard and his new wife Cobbs Leonard surprised their loved ones with their wedding after bringing them together under the guise of a "private dinner party." On Saturday, the gospel singer began posting Instagram pictures in her wedding dress alongside her new husband with the caption "Leonard2Infinity." "After a year of pre-marital counseling and much planning, the timing was finally perfect. It was incredible to be able to surprise those closest to us," Cobbs Leonard said in a V103 report. A number of Cobbs' gospel music industry peers were in attendance for the festivities, including singer Isaac Carree who congratulated the newly married couple. "Congratulations to my sister @tashacobbs & my bro @musikdr on getting married tonight," he wrote on Instagram. ""It was so beautiful! I love y'all!" Although James Fortune has written a number of gospel music hits, he was left speechless after the ceremony. "I can't even put tonight into words! Congrats once again to 2 of my favorite people! @tashacobbs @musikdr #leonard2infinity," he wrote on Instagram. Cobbs' frequent collaborator and fellow singer Vashawn Mitchell admitted that he was left emotional after watching his close friend get married. "So ya boy shed tears of joy tonight as my sister and brother @tashacobbs @musikdr jumped the broom #covenant," Mitchell wrote. The moment also seemed to be an emotional one for Pastor William Murphy, the gospel music singer who heads the Dream Center Church in Atlanta, Georgia, where Cobbs leads worship. "It's been one of the joys of my life to cover you. Now I'm blessed with the double honor, and joy, to serve you both," Murphy wrote.